The British pound saw its biggest daily fall since January. THE BRITISH POUND has tumbled in the wake of the UK election. 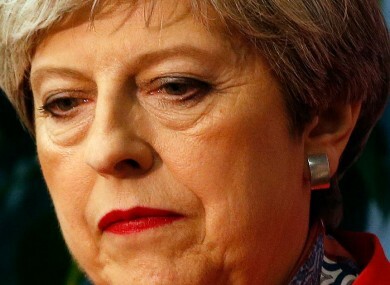 Sterling saw its biggest daily fall since January after an exit poll – now confirmed to be accurate – suggested the Conservatives would lose their majority, leading to a hung parliament. The British pound fell sharply late yesterday afternoon before gaining some ground this morning. At one point, it had fallen to $1.27 (down almost 2%) and 87.59p per €1. The triad of big events involving Britain, former FBI director James Comey’s testimony in the US and the European Central Bank (ECB) deciding to keep its ultra-low interest rates unchanged had earned the moniker ‘Super Thursday’, but produced no obvious pattern in global stocks, with London retreating, Paris flat, and Frankfurt and New York gaining modestly. “It’s going to be close, and results will come out through the night, but this is going to leave Theresa May struggling to keep control of the Brexit process,” Kit Juckes, an analyst at Societe Generale, said. Ultimately, the election is now seen as a failed gamble by Prime Minister and Conservative Party leader May. On Wall Street, attention was focused on Comey’s testimony on his firing by President Donald Trump and links to the investigation into Russian meddling in the 2016 US election. Comey testified that Trump asked him for “loyalty” and to drop a criminal investigation into his former National Security Advisor Mike Flynn. The former FBI director said he took painstaking notes of the extraordinary encounters for fear Trump might “lie” about the meetings, a step he did not deem necessary with previous presidents. Although the testimony painted an unflattering picture of Trump, analysts said most of the information had already been aired in press reports and the disclosures themselves were not disturbing enough to end the market’s bullish sentiment. Comey himself declined to address whether Trump’s conduct constituted obstruction of justice, an impeachable offense. “Based on what the stock market is doing, it did not see a smoking gun based on this testimony from Mr. Comey,” Briefing.com’s Patrick O’Hare said. Some legal observers have said Trump’s conduct as described by Comey constitutes obstruction of justice. However, O’Hare said the market’s reaction suggested it was sceptical of that reasoning and still views proposed tax cuts and other Trump growth measures as alive, along with his presidency. The Nasdaq rose 0.4% to a fresh record, while the Dow and S&P 500 finished barely positive. The ECB had earlier decided as expected to keep its ultra-low interest rates unchanged, saying it would continue its €60 billion monthly bond purchases to December. The central bank said it saw fewer risks to the eurozone economy as it increased its growth forecasts while cutting inflation estimates. It also dropped a longstanding commitment to slashing rates yet further if necessary. “The central bank made every effort to retain a relatively neutral stance overall, balancing any hawkish or dovish statement with something roughly equal and opposite,” market analyst Craig Erlam at OANDA currency traders said. “The fact that it no longer expects interest rates to remain at present ‘or lower’ levels is a clear deliberate signal that policy makers are gradually becoming more hawkish,” he added. Email “Sterling tumbles in wake of UK election ”. Feedback on “Sterling tumbles in wake of UK election ”.